“Shaun the Sheep Movie” is a British stop-motion-animation comedy full of bleats, barks, grunts, squeals, quacks and coos. 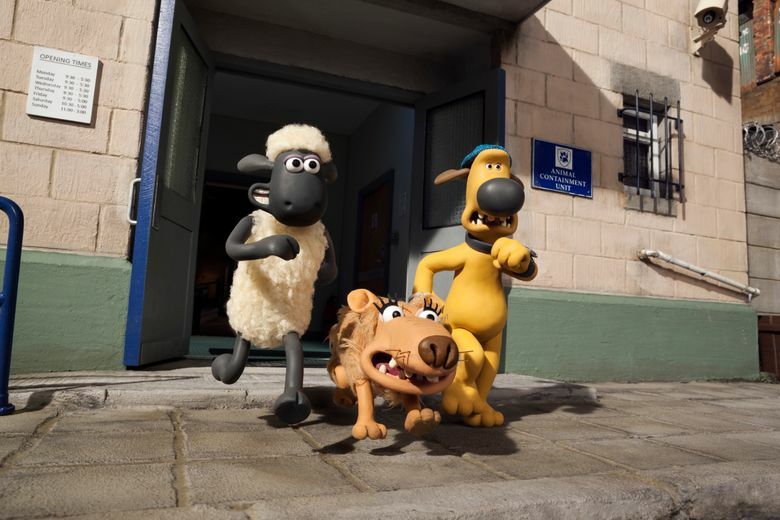 Nobody speaks in the adorable British stop-motion-animation comedy “Shaun the Sheep Movie”; instead, they bleat, bark, grunt, squeal, quack, coo — or, if they’re human, mutter something unintelligible. And yet, the storytelling’s captivating. Shaun and his sheep friends, tired of the daily grind at Mossy Bottom Farm, scheme to arrange a day off. Unfortunately, this results in the farmer (whose name is simply The Farmer) heading off to The Big City (i.e. London) in a runaway camper and developing amnesia … which means that the ever-resourceful animals need to save the day. Shaun, who has his own television series in the U.K. (my 10-year-old assistant assured me that the movie is much like the show), is one of the smaller sheep in the flock, yet he’s got leadership written all over him. (I’d hire him as a consultant in a flash.) Under his guidance, the sheep don costumes in an Animal Help charity shop (with Timmy, the littlest sheep, posing as a backpack), invade a snooty French restaurant called Le Chou Brûlé (The Burnt Cabbage), and stage an impressive jail breakout. They do, of course, track down the farmer — whose new profession is so appropriately delightful that I won’t spoil it — and eventually get home, presumably in time for tea. Along the way, we learn that sheep can sing harmony, that it’s a mistake to allow a passel of pigs free reign in your home (they are, shall we say, living high on the hog), and that everyone gets sleepy upon seeing a countable array of sheep jumping over a fence. And we’re reminded of the tactile charms of stop-motion animation, as practiced by the wizards of Aardman (known for “Wallace and Gromit,” “Chicken Run” and, more recently, “The Pirates! Band of Misfits”). Come back to the big city — and the big screen — anytime, Shaun. ‘Shaun the Sheep Movie,’ with the voices of Justin Fletcher, John Sparkes, Omid Djalili, Richard Webber, Kate Harbour. Written and directed by Mark Burton and Richard Starzak. 86 minutes. Rated PG for rude humor. Several theaters.